These are so good we keep one on every level of the house. 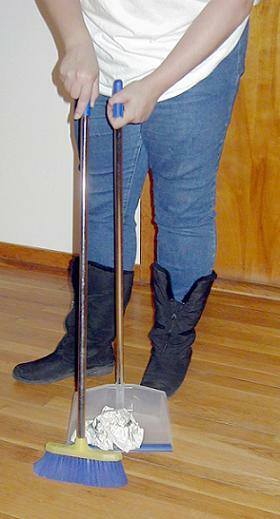 You'll never again have to bend over or get on your hands and knees to sweep up broken glass or dirt! Height is 34". The broom clips to the dustpan for storage. Photo shows an older model, but the new model is similar in function. Dustpans & brooms cannot be shipped economically by air. If you order one and specify either second day air or next day air, we will ship it by ground and refund the appropriate portion of the S/H charges that were billed to your card that represented the air portion of the charge. Because of the length and volume of the cartons that must be used to ship these items, the air shipping charges from UPS become comparable to, or even exceed the cost of the item itself.